Camden San Paloma offers upgraded one, two, and three bedroom apartment homes with modern finishes in the heart of Scottsdale, Arizona. Each apartment includes modern amenities such as upgraded appliances, granite countertops, LED track lighting plus a washer and dryer. We even have stand-alone casitas and assigned, covered parking. We've got just what you're looking for in this fun, resort-style neighborhood. Tucked away behind the shops at Agua Caliente, you won't need to travel far to find just what you need. 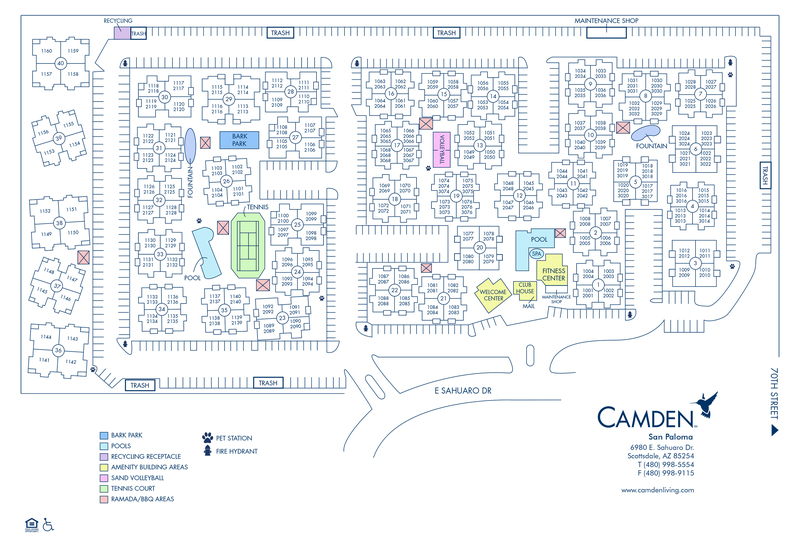 Camden San Paloma is zoned to the award winning Scottsdale Unified School District and is convenient to Horizon Park. Enjoy life at your Scottsdale apartment and take advantage of our 24-hour fitness center with yoga and TRX studios as well as dry sauna! We've even got lighted tennis courts, sand volleyball courts and two resort-style swimming pools for you to entertain friends or work up a sweat. Your fur-baby is in luck too because our pet-friendly apartments have an on-site enclosed dog park. Camden San Paloma is just a 5 minute drive to Kierland Commons and Scottsdale Quarter where you'll find the shopping and dining you're looking for. Plus, there's a Safeway grocery store within walking distance. Our community is also located close to the shops at Gainey Ranch, dining in Old Town Scottsdale, entertainment, and recreation. We can't wait to meet you! Schedule an appointment today. We'll save a spot for you! We offer one carport per apartment home. You may also choose to rent an additional carport for $25-$35 per month. Call us for details!